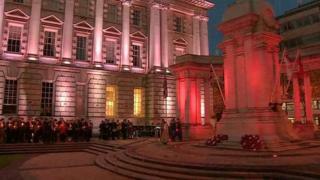 Lights have been switched off for one hour across Northern Ireland to commemorate the outbreak of World War One. The memorial, which took place between 22:00 and 23:00 BST on Monday, was inspired by the words of the Foreign Secretary at the time. Sir Edward Grey said: "The lamps are going out all over Europe; we shall not see them lit again in our life-time". Nearly 50,000 Irish-born soldiers are known to have died in World War One. Historians have estimated that more than 200,000 served in the British Army and Navy from 1914 to 1918.